Suzanne Belair What's new ? The Lakeshore Association of Artists is presenting their spring exhibition at Fritz Farm (20477 Lakeshore road in Baie D'Urfé) on April 20th, 21st and 22nd where I will be Friday evening for the vernissage and Sunday for most of the day. There is also a small exhibit that links artists from the Bolton-Austin areas and takes place at the St-Patrick Cultural Space situated at 854 Missisquoi rd in Bolton East. I will be presenting work there from July 6th to 15th. This summer, I will be participating in the 25th edition of the Circuit des Arts Memphremagog. I truly enjoy meeting people that show up at my studio door during the Circuit. This event gives visitors the opportunity to admire and purchase artworks from professional artists, see their creative space and admire beautiful vistas along the road. I hope to see you here. As usual, I will have two rooms full of paintings and many new works. Situated at 123 rue Du Lac des Sittelles, my Township studio will be open from 10 am until 5 pm starting July 21st to the 29th . There is also a collective exhibit at the Magog Visual Art Center, located at 61 Merry north in Magog where each artist is showing one piece of artwork representing his or her production. For more information, go on the Circuit's website: Just click here. I am also participating in the 20th Edition of the Bromont en Art Symposium that takes place in the Old village of Bromont from August 24th to 26th from 10 am to 6pm. The Lakeshore Association of Artists is holding its exhibition "Art by the Lake" on September 8th and 9th on the beautiful grounds of Stewart Hall. I will be there both days to greet you and will be presenting some new works. Everyone welcome! I am very excited to announce that I am now an active member of the Federation of Canadian Artists! This is opening new doors to be explored in 2018. The association has 2700 members across Canada. A fun and worthy project I am getting involved in is the Silent Skies Collaborative Mural Project. This Artists For Conservation's first international collaborative mural project will feature all 678 endangered species of birds of the world. The installation will be the artistic centerpiece of the 27th International Ornithological Congress that will take place in Vancouver from August 19th to 26th. The original artwork will then go on an international tour to select cultural/scientific venues. I signed up to paint two species of birds: the Banasura laughingthrush (Trochalopteron jerdoni), endemic to Southern India and the Collared laughingthrush (Garrulax yersini), endemic to the Da Lat plateau in Vietnam. Both birds are endangered because of degradation and fragmentation of their habitat. All canvases will be sized 8 X 8 inches. For more details on this mural project, click here. I just joined the Beaconsfield Artists Association. There is an exhibition this next October taking place at Centennial Hall from October 27th to 29th. Vernissage is on the Friday from 7 to 9 pm. Everyone welcome! This fall, I am participating in three charitable events taking place in November. The first "Square" exhibition and sale will take place on November 11th from 11 am to 4 pm. Lunch is served, including soup, bread and dessert for $ 5. In addition all artists will offer 12 X 12 inches canvases at the same very advantageous price. It is a date at 232 Chemin de Senneville, in Senneville, to raise funds for the Old Brewery Mission in Montreal. The second event is scheduled the same weekend on Sunday and I am happy to report that three of my paintings were selected to be sold during the Shield of Athena prestigious annual auction. This 23rd edition will take place at Le 1000 (1000 de la Gauchetière west) on November 12th starting at 2:30 pm. Monies collected will be used to help victims of family violence. I also participate in the ninth edition of the exhibition "De la couleur contre la douleur", organized by the group Artistes de Coeur. A portion of the sales will go to the Federation of Women's Shelters. Each artist painted 12 to 20 canvases of uniform size 10 X 10 inches. The exhibition takes place from November 22nd to 26th 3 at the Multifunctional Center of St-Lambert located at 81 Hooper street. The vernissage is Wednesday evening (29) from 6 pm to 9 pm. For more information, click here ! These are all wonderful opportunities to get an original work of art at a very reasonable price while helping these causes that hold us all to heart. This summer, I will participate in the 15th Edition of the Art Symposium EstivArts presented by the Magog Cultural Committee. This Magog summer event takes place August 5th and 6th on the grounds and inside the Magog Visual Arts Centre, located at 61 Merry street North. A collective exhibit will also take place from August 2nd to September 3rd 2017. A vernissage will take place on Saturday August 5th from 5:30 to 7:30 pm. 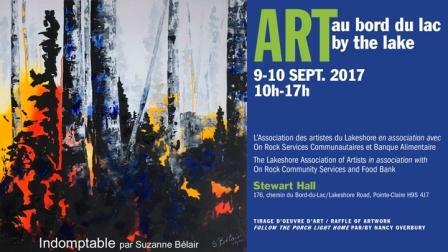 The Lakeshore Association of Artists is holding its exhibition on September 9th and 10th. I am will be there both days to greet you and will be presenting my 2017 collection including six new unseen artworks. My site # 31 is located on the higher part of the grounds, near the front parking area. Everyone welcome! The Lakeshore Association of Artists is presenting their spring exhibition at Fritz Farm (20477 Lakeshore road in Baie D'Urfé) on April 21st , 22nd and 23 rd where I will be Friday evening for the vernissage and Sunday afternoon. It is the 23rd year of the Circuit des Arts Memphremagog and this summer marks my sixth participation. I truly enjoy meeting people that show up at my studio door during the Circuit. This event gives visitors the opportunity to admire and purchase artworks from professional artists, see their creation space and admire beautiful vistas along the road. I hope to see you here. As usual, I will have two rooms full of paintings and many new works. Situated at 123 rue Du Lac des Sittelles, my Township studio will be open from 10 am until 5 pm starting July 23rd until and including August 1st. A collective exhibit takes place at the Magog Visual Art Center, located at 61 Merry north in Magog where each artist is showing one piece of artwork representing his or her production. For more information, go on the Circuit's website: Just click here. Furthermore, I am participating in the Symposium of representational art Rendez-vous des Artistes de Saint-Léo n'art that takes place this summer on August 19, 20 and 21st in St-Léonard, New-Brunswick, web site: Rendez-vous des Artistes . The Lakeshore Association of Artists is presenting their spring exhibition at Fritz Farm (20477 Lakeshore road in Baie D'Urfé) on April 15th, 16th and 17th where I will be Friday evening for the vernissage. The upcoming summer will be busy and exciting with the Circuit des Arts and confirmation of my participation in the Symposium Rendez-vous des artistes in St-Leonard, New Brunswick. More on this later. Fall is the season of change, the season for frenetic activity ! In other words, a busy time ! Exhibitions: I am exhibiting again this year with the Kirkland Artists Association at the Kirkland Municipal Library, located 17100 Hymus blvd. in Kirkland from November 4th to 28th 2015. The vernissage will take place on November 8th from 1pm to 3:30 pm. The exhibition ends on November 28th 2015. I am also participating in the 7th edition of the exhibit called "De la couleur contre la douleur", staged by the group Artistes de Coeur. A portion of the proceeds will benefit the Federation of safe houses for women. Each artist painted 12 to 18 gallery canvases sized 10 X 10 inches. 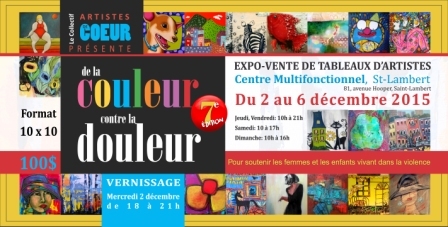 The exhibit takes place from December 2nd to 6th 2015 at the St-Lambert Multifunctional Center situated at 81 Hooper street, St-Lambert. The vernissage takes place on Wednesday December 2nd from 6pm to 9pm. 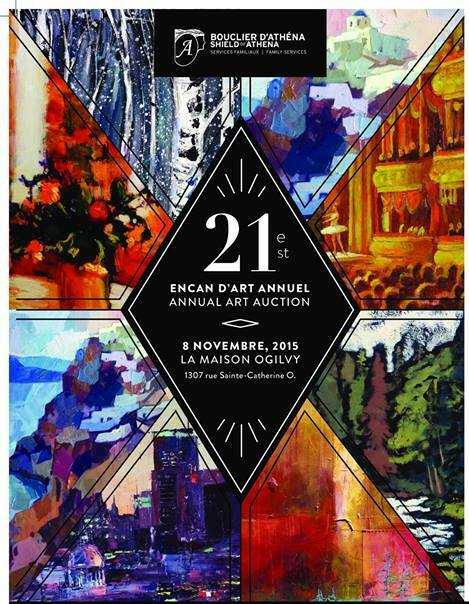 This is a great opportunity to acquire a reasonably priced original artwork while helping a good cause. All are welcome ! To find out more click here. Patrimoine Mansonville,Qc, Patrimoine 2,Austin, Qc et Patrimoine 3, Mansonville, Qc. J'ai encore des pièces en exposition au restaurant Le Bacchus, situé au 2765 rue King Ouest, à Sherbrooke. The Lakeshore Association of Artists is holding its exhibition on September 12th and 13th. I am exhibiting on Saturday the 12th and am offering a demonstration at 11:30 AM on background preparation of canvas to add or increase texture. This will take place at my site No. 13 on the shore of Lake St-Louis. It is the 22 nd year of the Circuit des Arts Memphremagog and this summer marks my fifth participation. I truly enjoy meeting people that show up at my studio door during the Circuit. This event gives visitors the opportunity to admire and purchase artworks from professional artists and to visit beautiful vistas along the road. I hope to see you there. As usual, I will have two rooms full of paintings and many new works. Situated at 123 rue Du Lac des Sittelles, my Township studio will be open from 10 am until 5 pm starting July 25th until and including August 2nd. 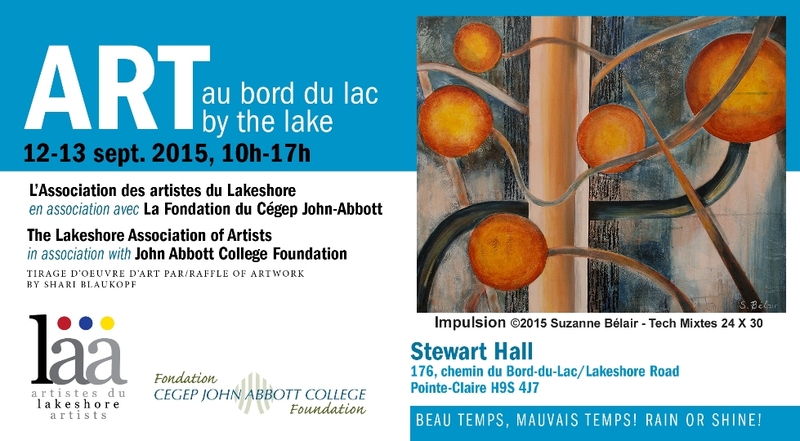 A collective exhibit takes place at the Magog Visual Art Center, located at 61 Merry north in Magog where each artist is showing one piece of artwork representing his or her production. For more information, go on the Circuit's website: Just click here. After a winter spent mostly recuperating from an unfortunate accident, spring will certainly be more pleasant. I am resuming my pace and working on a lot of projects. The Lakeshore Association of Artists is presenting their spring exhibition at Fritz Farm (20477 Lakeshore road in Baie D'Urfé) on April 24th, 25th and 26th where I will be Friday evening for the vernissage. I still have works exhibiting at Le Bacchus Restaurant, in Sherbrooke.